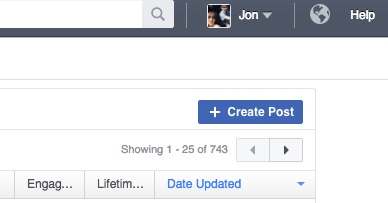 More than three years ago now, I wrote an article about how to create a dark or unpublished Facebook post. Well, that post is outdated, so it’s time to freshen it up. 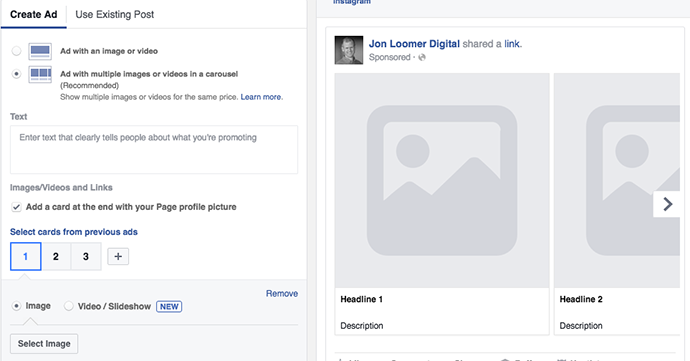 The truth is that unpublished Facebook posts are still needed, but most advertisers don’t realize they can be created. Let’s take a closer look at the value of unpublished Facebook posts and how you can create them. This is an inline page post ad where the advertiser creates the ad on the fly. In this case, it’s being done with a carousel of multiple image links, but you could also select “Ad with an image or video” to create an ad with one link. This approach is just fine, and it’s preferred in some cases. The nice thing about the inline page post ad is that it can be edited or easily duplicated and altered to create variations. But there’s one big issue: If you want to use the same ad in multiple ad sets, you can’t use an inline page post ad. Sure, you could replicate it. It would look the same as the original. But each ad you run will have its own comments, likes, shares and other engagement. In many cases, you want to leverage the great engagement you’re getting on one ad across other ad sets and campaigns. 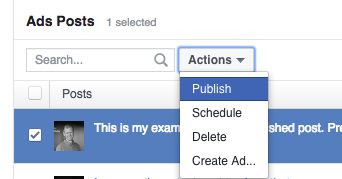 From the Ads Manager navigation, click “Page Posts” from the “Create & Manage” column. At the far right, click the blue “Create Post” button. 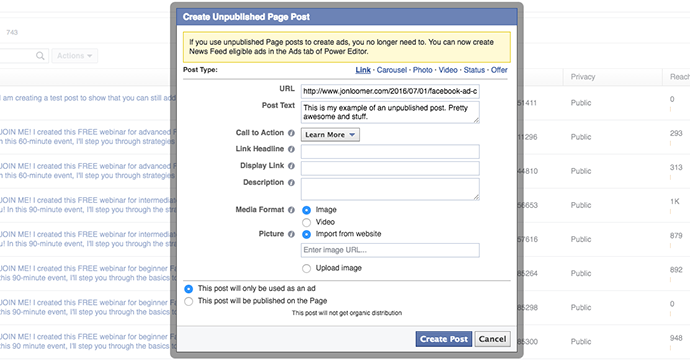 If you use unpublished Page posts to create ads, you no longer need to. 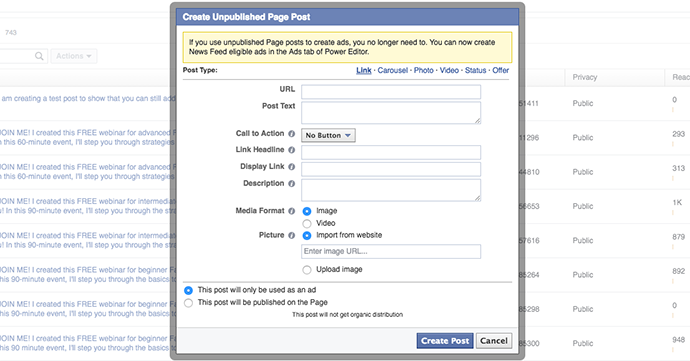 You can now create News Feed eligible ads in the Ads tab of Power Editor. Yeah, it’s true. You don’t need to create ads this old way anymore. But there are certainly advantages to it, as mentioned above. In this case, I chose not to provide a link headline, display link, description or image. If you don’t provide it, Facebook will attempt to pull it from your website’s metadata. But you can always choose to override it. This method is certainly archaic. You can’t see a preview of the ad while you’re creating it like you can with inline page post ads. Make sure that everything is how you want it first because you won’t be able to edit it! Now go back to the ad creation process in Power Editor. Instead of using the default method, click “Use Existing Post.” Then select the post you just created. What’s nice is that you’ll now be able to create multiple campaigns or ad sets that promote the same ad — not just ads that look the same. 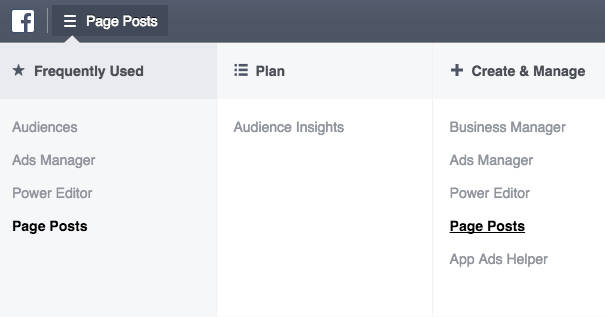 That way, each separate promotion of that ad will contribute to the comments, likes, shares and other engagement. There are several reasons why you might want to publish an ad. 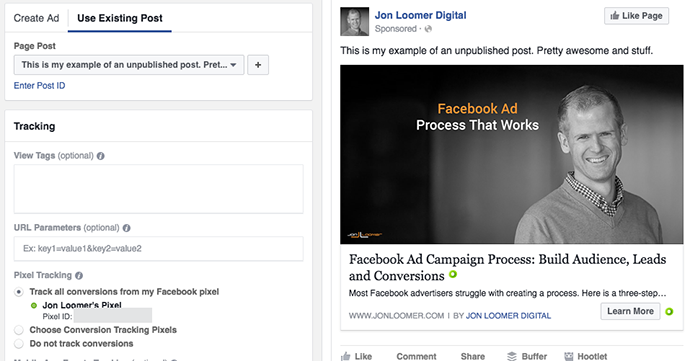 One reason is that you can’t currently add a call-to-action button to organic posts from the Facebook publisher. But you can create an unpublished post with a CTA button and then publish it. Or maybe you’re getting a ton of great engagement on your ad, so you’re confident it will do well if published to your fans. If you use the default method for creating an ad, you can’t publish it. You’ll need to create a new post from scratch. But if you created an unpublished page post as I described, you can publish it to your fans, complete with the engagement it collected. You’re done! What previously existed only as an ad has now been published to your fans organically. There’s nothing novel about this approach, but very few advertisers realize the benefits or that it can still be done. Are there any other reasons you’d create unpublished posts?